4 stroke motocross bikes and four stroke dirt bikes. 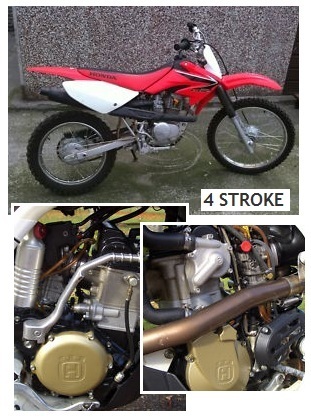 Four stroke dirt bikes coming of age. 4 stroke Motocross Bikes – what about these types of dirt bikes ? Larger breed 4 stroke motorcross bikes challenged 2 stroke bikes and riders by requiring more strength and handling skills. Even riders get complacent and are not easily convinced to give up the bike they love and succeed with, such as the 2 stroke. Major manufacturers like Yamaha, Kawasaki and KTM had the best of both worlds at the beginning of this century, riding a high with the cherished 2 stroke while convincing top riders to switch to 4 stroke motocross bikes. Top techs and engineers increased performance. Amateur events allowed 2 and 4 stroke 250ccs to compete at one another. Traditional MX bikes remained constant while 4 stroke motocross bikes advanced in handling and performance. 4 stroke motocross bikes are comparable to the toughest, orneriest broncos at a rodeo. No rider is anxious to trade a win for something requiring skill and stamina because it is hard to handle. Brand to brand, performance is a concern. AMA made a 4 stroke displacement exemption rule in 1998 to open the doors for manufacturers to continue the push for the larger bikes, with Yamaha's 1998 YZ400 grabbing a big share of the motocross sales. The AMA circuit's last competitive 2 stroke 250CC rider, James Stewart, was still winning motos in 2006 but changed midseason to 4 stroke motocross bikes. The crossover to four stroke motocross bikes possibly has something to do with the vanity of riders demanding recognition in a "Hey, look at me, I'm bad, I can handle this and my bike is bigger than your bike" attitude. Definitely, sales and money influenced the manufacturers because 4 stroke technology started beating the 2 stroke MX bike. As pros moved to 4 stroke motocross bikes, fans followed the lead of their heroes. Sayonara, AMA pro circuit 2 stroke competitions. 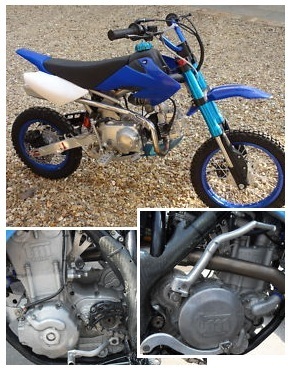 What do 4 stroke motocross bikes offer in 2011? The 2011 Honda CRF250 4 stroke has a new frame and electronic fuel injection. 4-stroke MX motos in the future. No time for long analysis, it seems this was a switch to see what happened. The result is less than satisfactory with over-steering and limited power. Showa suspension is good, although the chassis shakes and the forks dive. Kawasaki constantly works to improve their product and the 2011 Kawasaki KX250F approaches 30 changes. Handling improved, but its proneness to push from center-out in corners is not resolved. The Showa SFF suspension system allows fork preload adjustment with a fork cap dial. Digital fuel injection does not offer a lift, cutting back on powerband delivery. 2011 KTM 250SXF four stroke motorcross bikes have a revised steel frame, offering a lightweight bike with great handling. A new linkage suspension system needs additional work, as does the effect of the electronic fuel ignition on the powerband. Yamaha techs and engineers were busy improving 2011 YZ250F 4 stroke motocross bikes with a stronger aluminum frame for better handling. Suspension is affected by riders over 150 pounds and hopefully 2012 will provide more power. Addressing the suspension problems most 4 stroke motorcross bikes seem to have, Suzuki RM-Z250 tweaked the undersprung issue for riders over 150 pounds, with a resulting Showa suspension holding up for just about any rider. The future of 4 stroke motorcross bikes & four stroke pit bikes lies in the economy. Motocross competitors with years of competition, skill, talent and professionalism can handle the extra weight of the bike. Younger competitors see the casual approach, comfort and success of experienced riders and want to try to tame the beast. Sustaining and increasing the number of amateur MX riders, families and friends involved in competition of four stroke motocross bikes will bring the cash flow needed to survive.